This article explains how a Pozyx system based on the DWM1000 can be used as a short-range substitute for a GPS allowing position control modes like Loiter, PosHold, RTL, Auto indoors. This is an experimental feature released in Copter-3.5. Better results may be possible by using Copter-3.6 and enabling the EKF3. 4 Pozyx anchors and 1 Pozyx tag. Note the Ready to Localize or Developer Kits are more economical than buying individual tags and anchors. The anchors should be placed in a rectangular shape. The anchor with the lowest ID (IDs are printed in hexidecimal on each device) will act as the “origin” and should be placed at the lower-left corner of the rectangle. Each of the remaining three anchors should be placed in a corner so that the anchor IDs increase as you travel an “N” pattern within the rectangle. 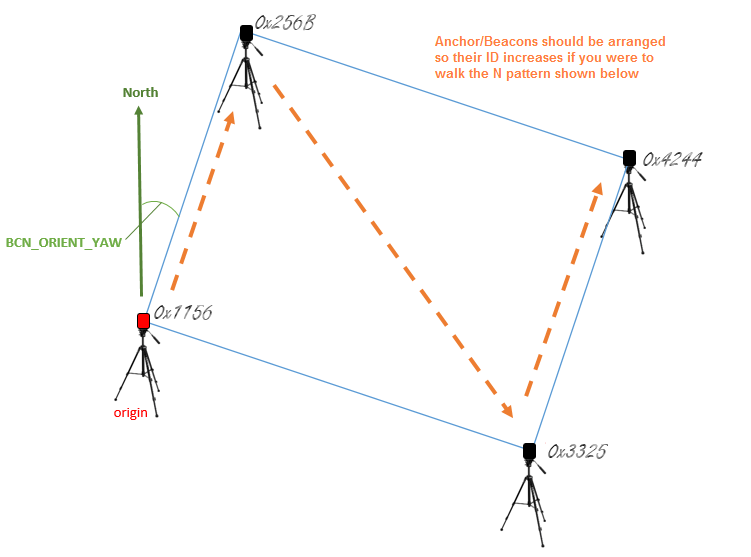 The configuration is slightly simpler if the line from the origin anchor to the 2nd anchor is due North but it is not required as the BCN_ORIENT_YAW parameter can be used to account this difference. connect one of the Pixhawk’s telemetry connections to the UNO. Telem1 is shown above but Telem2 or Serial4/5 will work equally well. Pixhawk’s GND should be connecdted to one of the UNO’s GND pins. Pixhawk’s TX should be connected to the UNO’s pin 10. Pixhawk’s RX should be connected to the UNO’s pin 11. Pixhawk’s VCC may be connected to the UNO’s 5V connector to provide power to the Uno/Pozyx from the Pixhawk. The Arduino IDE should be used to load IndoorLoiter sketch onto the Uno after first changing the anchor tags found here to match the IDs of the tags in your setup. powering on all the anchors. connect the UNO’s Type B USB to your PC. connect with the Arduino IDE’s serial monitor (set to baud 115200) and check no “Beacon Configuration failed” messages appear. If they do, check that the IDs have been set correctly in the IndoorLoiter2.ino sketch (above). Mount the Pozyx tag on the top of the Arduino Uno and then mount on the vehicle. set BCN_LATITUDE, BCN_LONGITUDE and BCN_ALT to match your actual location. Getting these values exactly correct is not particularly important although getting it close is required in order for the compass’s declination to be correctly looked up from the small database held within ArduPilot. Connect the Flight Controller to a ground station. You may need to connect the Lipo battery as well because some computers are unable to provide enough power through their USB port for the combined Pixhawk+Pozyx+Uno. After about 1 minute the vehicle’s position should jump to the lattitude, longitude you input during the configuration step (above). If it does not, connect a USB cable to the UNO’s USB port and open the Arduino IDE’s serial monitor and look for errors. Setup the transmitter with Stabilize, AltHold and Loiter flight modes. Take off in AltHold mode and maintain a stable hover. Switch to Loiter but be ready to switch back to AltHold or Stabilize if the vehicle’s position or altitude becomes unstable. The distance to the beacons can be found in the dataflash log’s BCN message’s D0, D1, D2, D3 fields.